When Cherry turned one it was such a big deal, we had three parties over the weekend before then a day out on her actual birthday. Fast forward to Tiger and throwing a party seemed a bit pointless as he’s still a baby and doesn’t even have the first clue what a birthday is. Plus he doesn’t really have any of his own friends yet. When Cherry was a baby I spent most of my week going to play groups, it was a great way to make friends both for me and Cherry, there is a group of us who all met at these groups and who are still friends today which is really nice but I guess because of that I’ve been rubbish at going to any groups second time round. I’m just not a fan of sitting in a room full of screaming kids! I guess it’s less important second time round too as I don’t have to worry about him not interacting with other children because he spends time with his cousins, Cherry’s friends and their younger siblings and of course he spends his whole life with Cherry tormenting him, I expect he is sick of kids too! We still had a lovely day though. 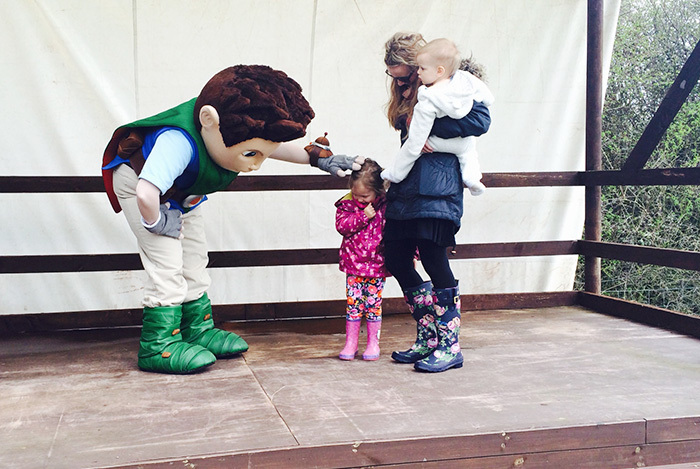 We went to meet Tree Fu Tom, I was the only parent to actually get on stage with their kids! I’ve met Upsy Daisy and The Zingzillas before though so I had to add Tree Fu to my photo collection! Plus Cherry was terrified so I doubt she would have gone up without me. Then we walked around a farm and saw some animals during which time we learnt that J has some kind of animal phobia. This was his reaction to the sheep, I’ve never seen him so scared of anything in his whole life, he screamed his head of and started sobbing, bless him! If you look closely at the photo below it’s really creepy, it looks like Cherry and J’s head has merged into one!! Then we came home for cake. I can’t believe a year has been and gone already!